Blue is a beautiful color, and would be a wonderful addition to any wedding. 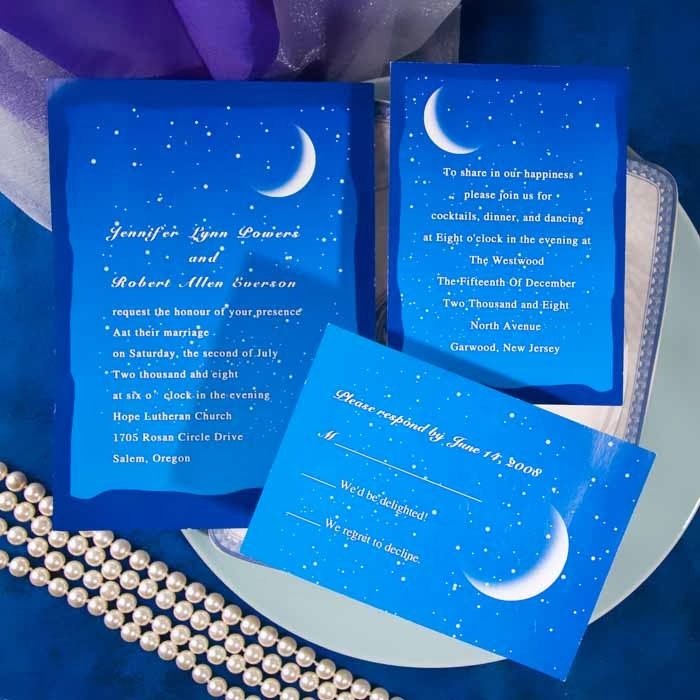 Having a blue wedding theme is even better, the color symbolizes peace and harmony as well as trust and loyalty, qualities of a happy marriage. 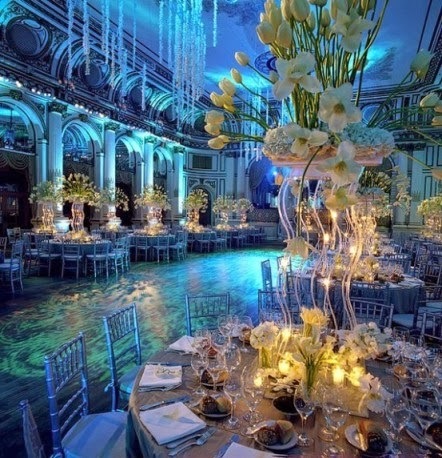 Blue is one of the most popular colors used in weddings. It's a calming color that appeals to most people and there are so many gorgeous shades to choose from. For most women the iconic Tiffany's blue come to mind, it is in fact a very common color for weddings. There are many ways in which to use the color blue. 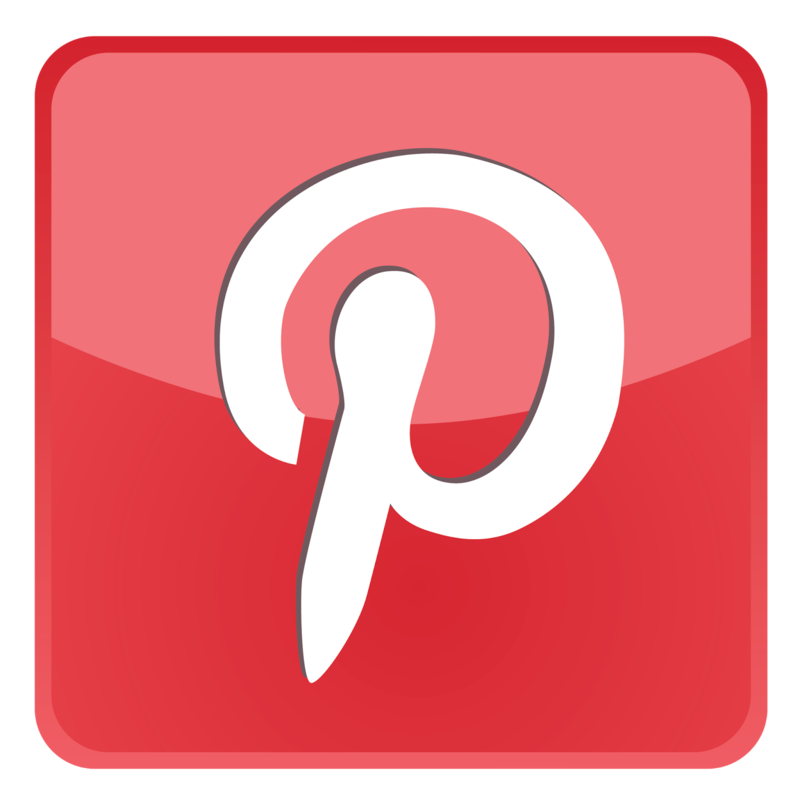 It can be applied to just about any part of the wedding ceremony and reception, from the attire to the flowers and decorations. Blues and whites look beautiful together, it's the epitome of elegance. Pair blue together with silver and it gives off a sleek and modern feel. A combination of different shades of blue also work well. 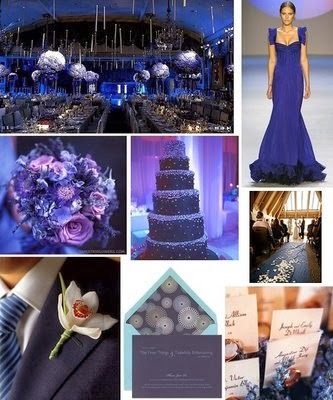 A blue wedding theme should include lots of blue so people make no mistake that the color is the overall theme. We can start by selecting flowers that are naturally blue. 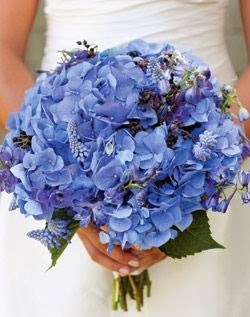 They include hydrangeas, muscari, delphiniums and agapanthus. Add those to your bridal bouquet or floral arrangements for the centerpiece to add a bright pop of color. They go great with flowers that are in shades of white or purple. The bride should always have on something blue as the old saying goes. 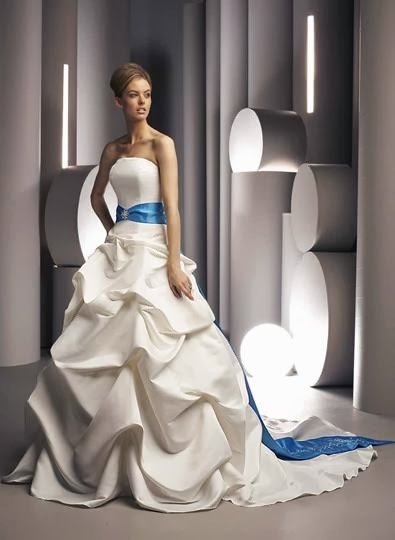 A light blue or turquoise sash would look absolutely gorgeous on a white wedding dress. If you don't want the color to be too obvious you can use it in the form of accessories such as jewelry or headpieces. A turquoise necklace will look stunning on brides going for a more casual look. 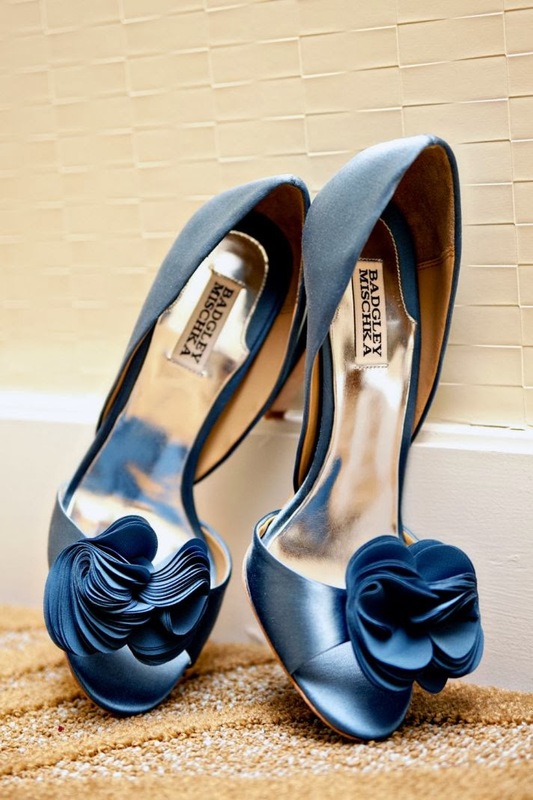 Don't forget about the shoes, try a pair of blue pumps or slippers to go with that beautiful white dress. Just remember to make sure it doesn't overpower your complete look, but rather enhances it. Blue decorations should not be too difficult to come up with. 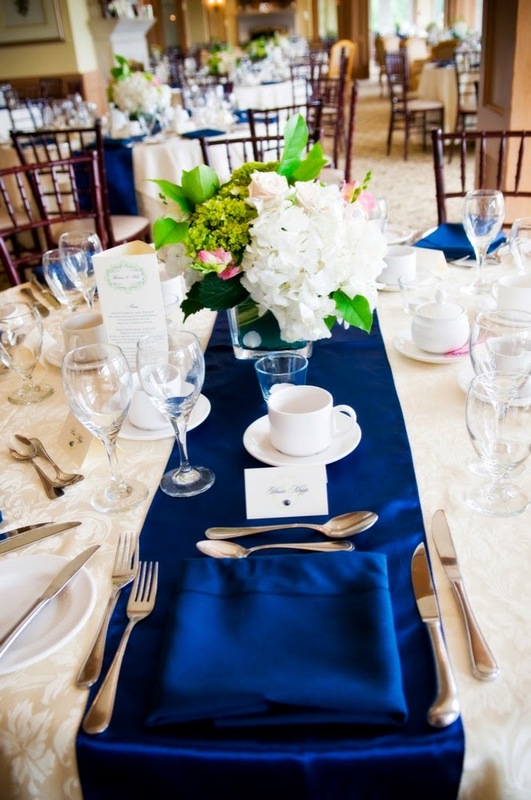 Blue and white create a great combination for the tables during the reception. 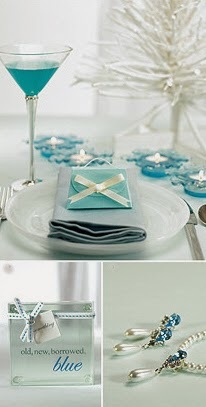 Think about using white plates on blue tablecloth or the other way around. You can even add a nice glass bowl of water with candles and flowers floating to the top. Have blue ribbons adorned on the backs of the seats. Start with those ideas and think of some more on your own. 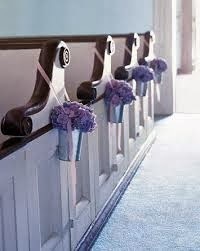 Other creative ideas include having all the groomsmen and bridesmaids wear the same shade of blue. The guys can wear ties that match the girls' dresses. The signature drink that is served at your wedding reception can be blue as well, just ask the bartender to serve up something with a bit of blue coloring. 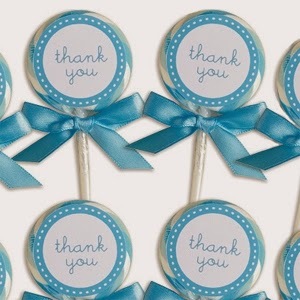 Wedding favors should always go with the theme of the wedding. 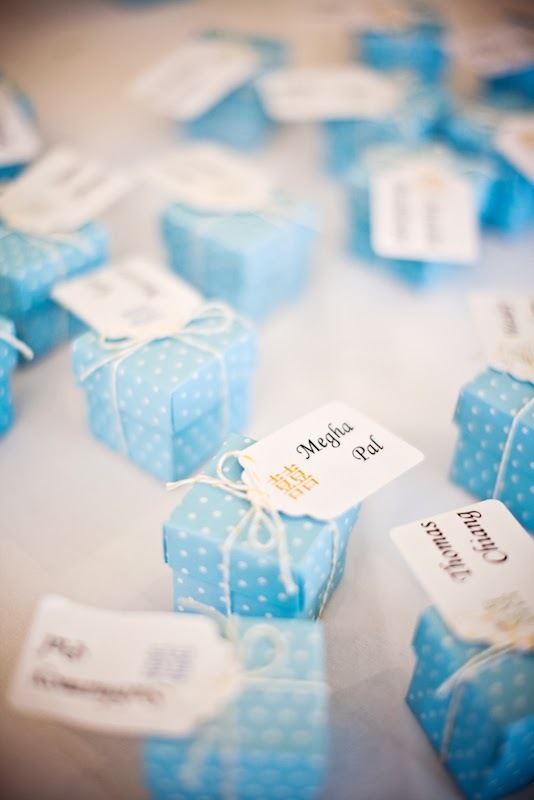 Wouldn't it be fun to give your guests something that's wrapped inside a little blue box that resembles a Tiffany's box? There are so many fantastic things that come in blue, you definitely will not have any trouble finding them.